This award recognizes the extraordinary compassion and care that our nursing and patient support teams demonstrate to our patients and their families 24 hours a day, seven days a week, 365 days a year. Roswell Park Cancer Institute has again been honored by the Press Ganey organization for consistent superior performance in the area of patient experience. 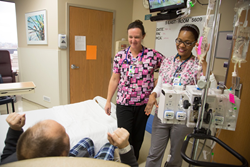 The comprehensive cancer center has received Press Ganey’s Guardian of Excellence Award for the third year in a row based on its sustained ranking among the top 5% of hospitals for patient satisfaction related to inpatient care. The rankings are based on the Hospital Consumer Assessment of Healthcare Providers and Systems survey, a tool administered by the Centers for Medicare and Medicaid Services to document patients’ perceptions about the hospital care they have received. “We commit to provide our patients and families with care at the very best level, so it’s very important to us that we measure up to the best care in the nation when independent organizations like Press Ganey assess patient satisfaction across the country,” says Candace Johnson, PhD, Roswell Park President and CEO. Press Ganey is a premier provider of patient experience measurement, performance analytics and strategic guidance for health care organizations. For more information, visit pressganey.com.